In most every newsworthy situation, there’s a result, and there’s a story. This is one of those. 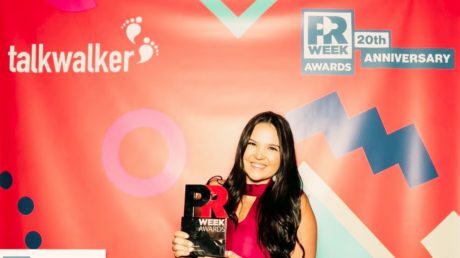 The result is that PRWeek, the leading journal on the public relations profession, just named the University of Alabama’s Alana Doyle the top PR student in America. It’s worth noting that this was the second straight win for an Alabama PR major. Maret Montanari won it last year. And to complete the record, UA’s Gabby DiCarlo was among the five finalists for the recognition that went to Doyle this year. The story behind the result goes something like this — and to cut to the punch line, it’s a story of effort, intelligence and the element of “randomness” that always helps a good story take form. Alana came to Alabama from Scottsdale, Ariz., as a semi-“undecided” freshman. She didn’t have a major, but did know that she’d be working her way through school. Through the university’s work-study program she landed in the front office of the advertising and public relations department. She could have just as easily ended up maintaining periodicals in the campus library or filing parking tickets in the university transportation office. Instead, through a process of keeping her eyes open, listening and coming to understand what the practice of public relations entailed, Alana experienced an epiphany about what she might want to do for the rest of her life. She declared a PR major, immersed herself in programs like the Capstone Agency (the largest student-run agency in the nation) and secured internships. Along the way, she kept that first work-study job. Fast forward to last week, when PRWeek recognizes her as the top student in America in this discipline. I’ve had the privilege of seeing Alana in action in a range of situations. She’s going to be a high-impact player where ever she goes following graduation. Her story also reinforces this enduring lesson – one I first heard expressed by another stellar UA public relations graduate, Myreete Wolford, who’s leaving her own mark at Ketchum in Chicago. Mark Harris is a communications consultant and a visiting professor in the advertising and public relations program at The University of Alabama. Mark is former vice president, communications, IBM Global Business Services and a proud graduate of The University of Alabama.